1. A persistent cough, commonly associated with smokers that starts in the morning when the smoker gets-up. This is caused by phlegm (a glutinous liquid secreted from the mucus membranes) that can be found in the back of the throat. The phlegm causes an irritation within the throat where the smoker feels it necessary to cough. 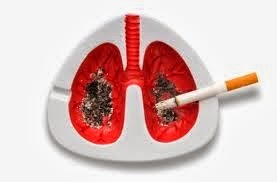 However, not just smoking can cause this type of cough, as those who have been exposed to irritants breathed in through the nose or mouth over a long period of time can also be affected. 2. Shortness of breath, wheezing, chest pains, or coughing-up tiny amounts of blood may also indicate the possibility of lung cancer. These symptoms are usually attributed to getting older, out of shape, or a little over-weight, although in reality they may well be caused by cancer cell growth within the lungs that may have also metastasized to the surrounding tissues. 3. Continuous fatigue even after a good nights sleep that may also be accompanied by weight loss when neither a diet or exercise regime has been put in place, and when eating normally. These are symptoms often associated with lung cancer, and are often classified as being non-specific as they can be easily put down to other causes. 4, A lingering dull aching pain within the area of the shoulder that may move down the outside of the arm, or a dull aching pain in the back often gets over-looked and put down to the after effects of some activity that was done sometime before. However, this may also be a warning sign of a developing cancer, where the nervous system has been invaded by cancerous cells. 5. Chest infections or pneumonia, that are recurrent (persistent) may show that the tubes from the lungs may be obstructed by small abscesses growing on the inside which have a tendency to grow into malignant tumors as time goes by. Obstruction of these tubes is also consistent with a partial or complete collapse of the lung. When these not so obvious warning signs become apparent, a quick trip to the doctors is advised. However, if after the doctor is unable to reassure as to why these symptoms exist, then a second opinion should be sought.